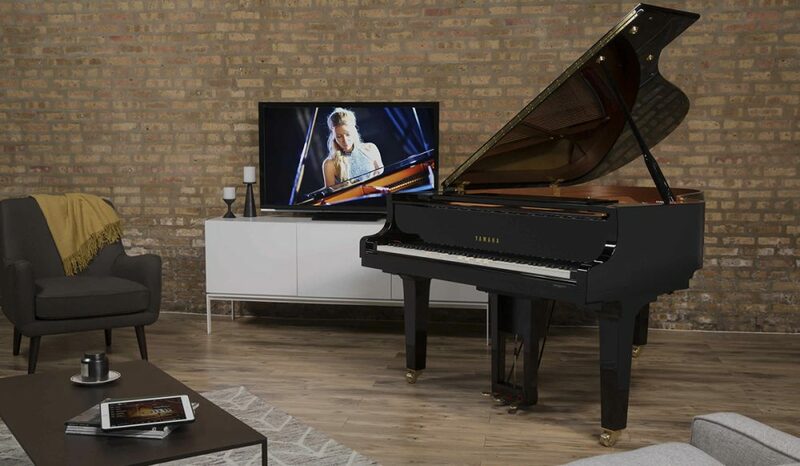 The Yamaha DGC1 is a 161cm grand piano with full Disklavier Entertainment & Educational features. The DGC1 Disklavier is, first and foremost, a grand piano. When played by a pianist, the instrument behaves in the same way as any other piano with its 88 keys, strings, hammers, iron frame and everything else that is in a piano. On the outside the DGC1 Disklavier looks identical to a Yamaha GC1MPE piano with the visual differences primarily being a control unit, and the electrical cable that plugs into the wall. Hidden inside the piano is an impressive collection of sensors & solenoids, and a few circuit boards. All electronics and mechanics have zero affect on the feel of the action. The tone of the piano is the same as any normal Yamaha piano. There is also a Silent feature that prevents the hammers from hitting the strings, thus making it possible to play the piano and listen using headphones. The Disklavier can do things a normal piano cannot. One can record and play back performances, complete with moving keys and pedals. The DGC1 can stream performances from Disklavier Radio, 24 hours a day. MIDI (musical instrument digital interface) data can be sent to, and received by a PC. Hence, notation can be recorded, edited, printed and displayed on your computer – and then played back through the keys of the piano. Disklavier pianos are available in all sizes from 151cm up to the full concert grand at 270cm. The ‘self playing’ piano has many applications and offers many benefits for schools, restaurants, piano teachers, recording studios to large concert halls. Australian Piano Warehouse offers the full range of Yamaha grand and upright pianos at Australia’s best prices. Australian Piano Warehouse is an Australian owned family business since 1964. For other Yamaha non-Disklavier models CLICK HERE.